Based on the History's Mysteries series on The History Channel. There are many phnomena that have remained unexplained mysteries. The question of whether or not something exists, or the explanation for unusual occurrences is constantly being explored and investigated. 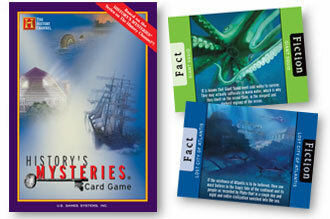 The History's Mysteries Card Game is full of intriguing subjects such as the Loch Ness Monster, Big Foot, Crop Circles, Ghost Ships, and more. This rummy-like games is as fun as it is interesting to play while players strive to collect different mysteries and score the most points.